Triboluminescence is an optical phenomenon sometimes seen when there is relative motion between two contacting surfaces. Everyday examples include sugar cubes or candies that are rubbed together, and many adhesive tapes will emit a flash of light when they are ripped from a surface. Physicists from the University of California at Los Angeles set out to characterize ‘sticky tape’ triboluminescence, with surprising results. The energy released by peeling sticky tape in a vacuum was observed to extend into the X-ray regime, and was of sufficient intensity to be used for X-ray photography. 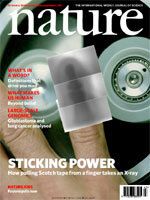 The cover picture shows the X-ray image of a human finger taken with peeling tape (off-the-shelf ‘Scotch’ tape was used) as the X-ray source. 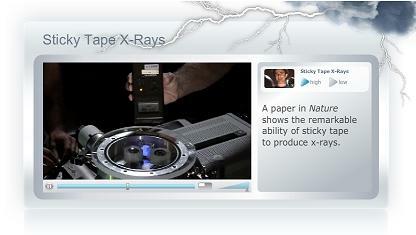 The developed X-ray is superimposed over a view of the experimental set-up. The energy concentrating process at work here poses an interesting challenge for the theorists, since the limits on energies and flash widths involved are beyond the predictions of current theories.